Super-duty opener assemblies for JD XP, ME5 planters! We now have Forges de Niaux opener blade assemblies for late-model JD planters (XP & ME5). And with larger bearings than OEM or other aftermarket! These puppies use Peer double-row 205 bearings, whereas OEM and other aftermarket are double-row 204 bearings (smaller diameter). They also use 5/16″ rivets instead of 1/4″. Other steps are taken to assure quality fit and bearing longevity. For instance, the heavy-duty stamped steel bearing hub is finish-machined, unlike OEM and other aftermarket. This insures a precise fit of the bearing, so it runs cooler, and eliminates distortions that shorten wear-life. The rivet holes are machined as the final step, so that they align perfectly with the blade’s holes. So, not only do we fully expect 20% longer wear life from the Niaux blade versus the next-best (Ingersolls or Bellota), and remaining sharper during that life, but also have bearings and other components to last long enough to actually be able to easily run for those 20% additional acres. 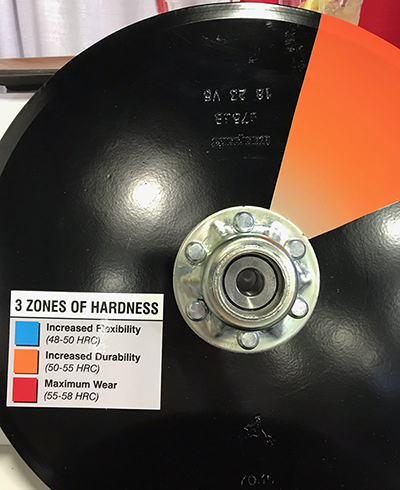 Exapta hasn’t done much with planter opener blade assemblies until now—we were never able to offer anything that was better, and we don’t like selling something unless we have a significant advantage over what’s already on the market. So, here you go! A great fix for anyone who has trouble trashing out bearings quickly, or breaking rivets out of the hubs on JD XP / ME5 planters, in tough no-till conditions.